Working with agency Marketplace Marketing, the team at Medical. 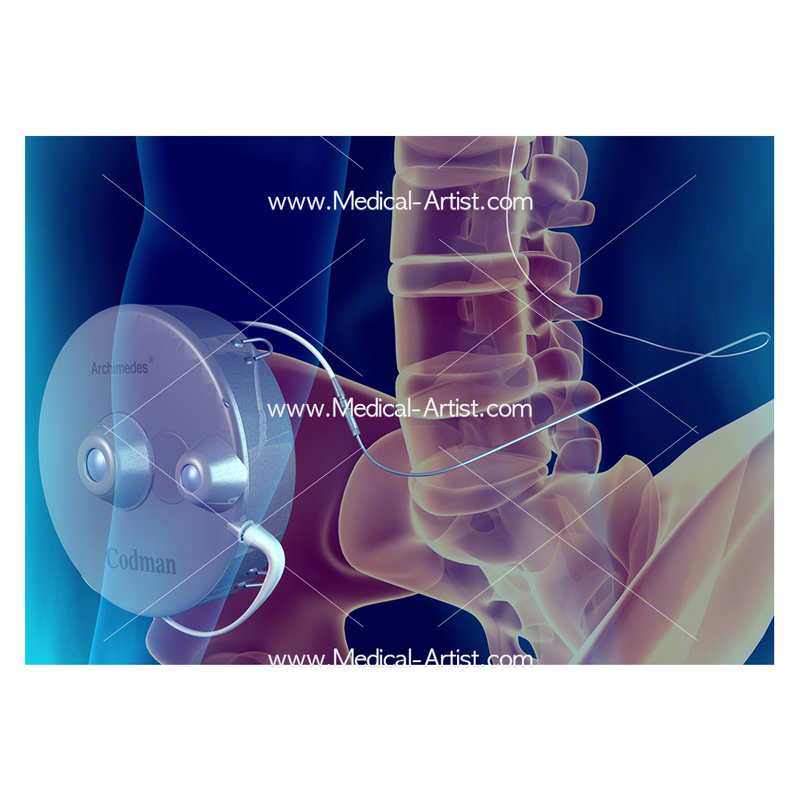 Artist.com were commissioned to create a number of medical animations, medical illustrations and 3D medical device models for the client Codman; part of the Johnson & Johnson Group. The aim to combine a set of multi visuals together with written text to be used as a presentation piece in an iBook format. 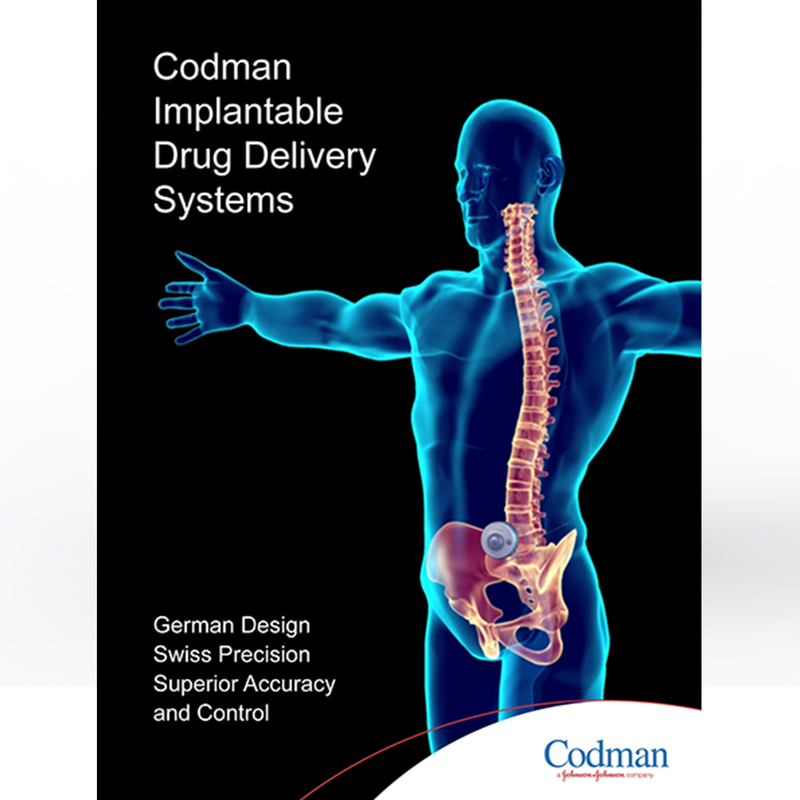 The purpose of our putting together an iBook presentation was for it to be used as a sales tool by the Codman J&J sales team, when demonstrating their new infusion system for spinal drug delivery to demonstrate it to medical professionals. 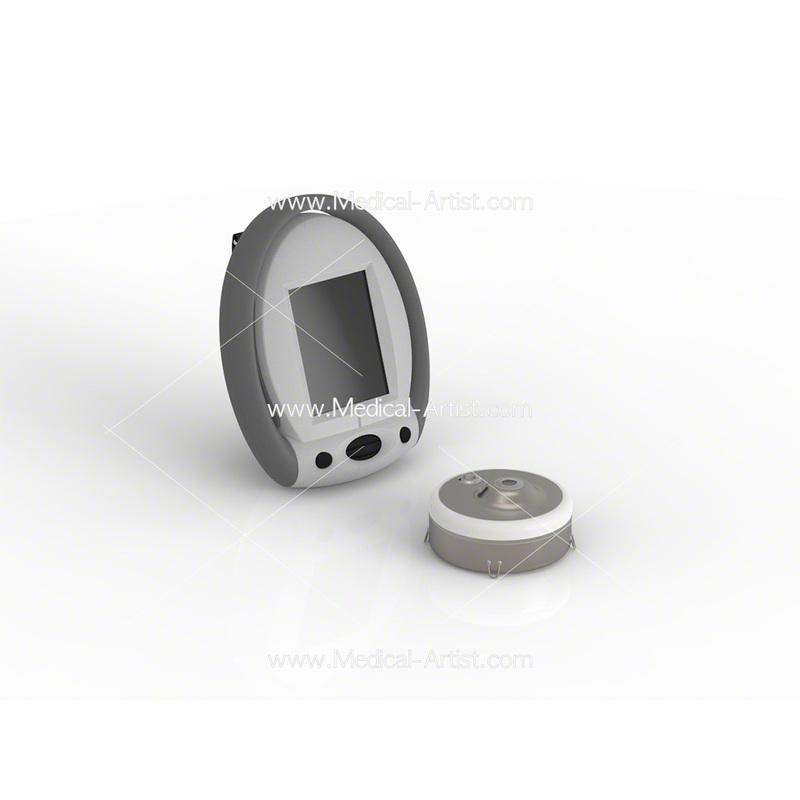 The team were tasked with creating a range of visuals to help promote a new medical device called a Medstream Programmable Infusion System. A revolutionary drug pump system with the purpose to deliver pain killing drugs like baclofen to the spinal canal of patients in a very controlled manner. 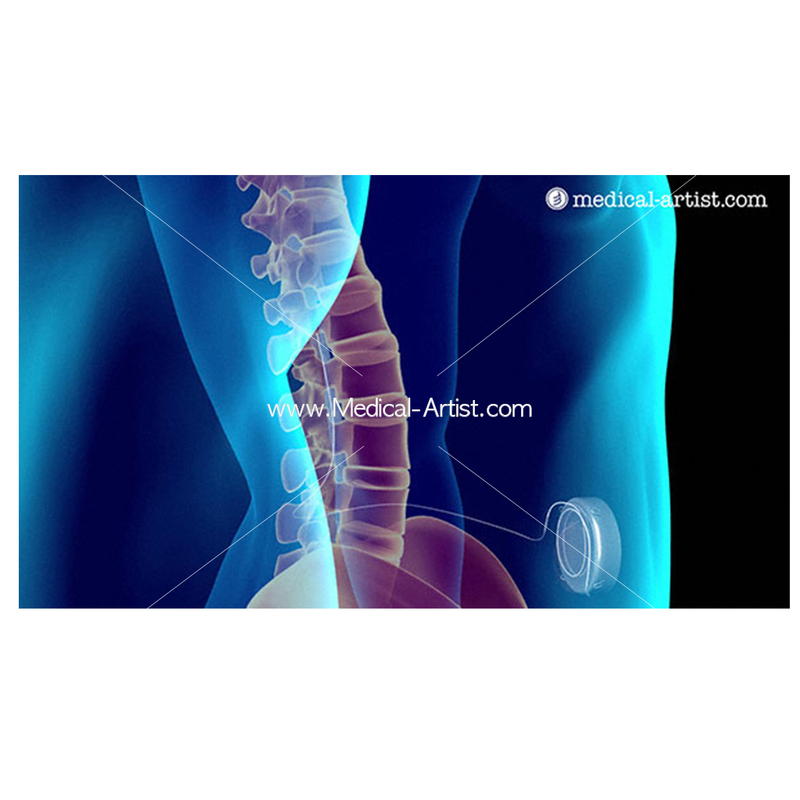 The range of visuals was the creation of hyper realism 3D medical devices to be incorporated into a custom 3D animation showing how the drug was delivered into the spine. 2D medical illustrations were required for printed pull out to accompany the marketing materials and the visuals were to be completed as an iBook presentation which was to be a sales aid for the product for the J&J sales team. Surgically it involves the implantation of a pump inside a patients’ abdomen. To operate the pump device once inside the abdomen clinicians can use a computerised wireless control unit to non-invasively program dosing and flow rate for each patient based on their specific needs. 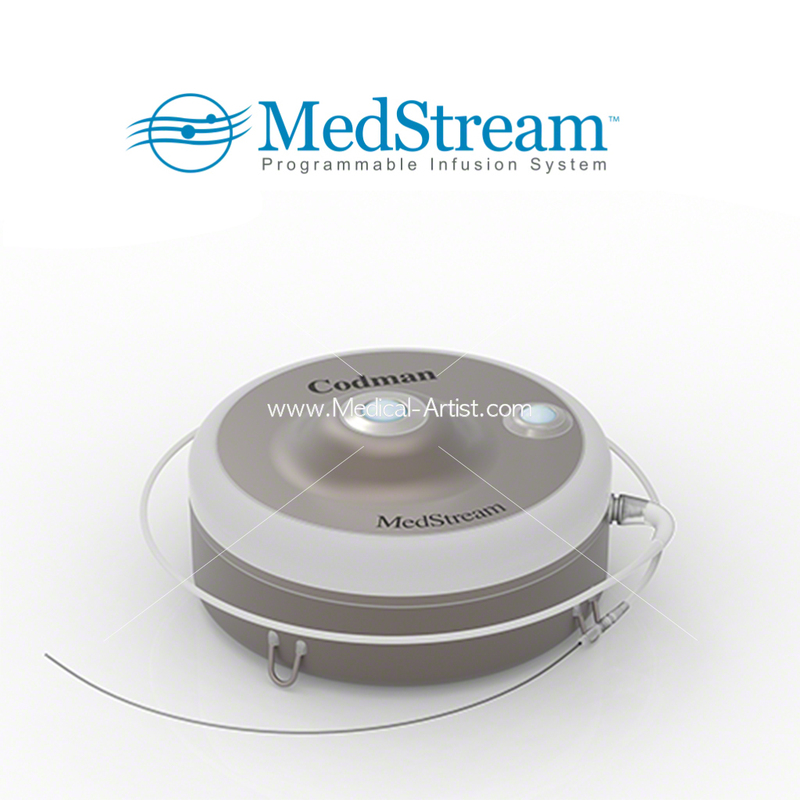 The Codman pump has been designed to hold approximately one ounce of medication. Implantation of the pump is done in the operating room under local or general anaesthesia. The pump is placed under the skin in the fatty area of the lower abdomen. Depending upon the flow rate of the individual pump for each patient, a doctor or nurse will refill the pump every four to eight weeks. The manufacturer recommends the pumps battery will run the Medstream for eight years whilst staying within the 10% of the recommended delivery dose. The Delivery System The drug Baclofen is transported from the pump directly to the spinal area using the new Surestream Catheter technology. The titanium pump is circular in shape with a small, raised area in the centre called a septum. This septum is where a nurse would use a special needle to fill the pumps storage reservoir with pain medication via a needle stick through the skin. The medication flows from the drug chamber into the selected body site at a constant rate through a small flexible tube which is the Surestream catheter. Our brief was to help illustrate the benefits of this system through a series of educational visuals that would show how this device could be such a huge benefit for those patients suffering from long-term chronic pain. Through its use would mean patients could avoid having a daily injection and it would mean the reduction of the side effects of oral administration of a drug. It would mean a reliable pain release system directly into the spine that would not only maximise the effect but allow patients to return to some normality of life by reducing daily hospital visits. Bringing all of this together was project manager Tim Butler, who coordinated the various artists within the team throughout the project over the course of several months. Different members were tasked with sections of the project such as the 2D illustrations, 2D animations, the organic (human anatomy) 3D illustrations, the inorganic 3D and the 3D animation. The teams first task was to create 3D models of the Medstream and Archimedes pump device and the Surestream Catheter to demonstrate how the new technology pump worked by looking inside the pump. And to generate photo realistic renderings of the pump and so that it could be rotated 360 degrees for those seeing it for the first time to gain a full understanding of how the pump worked. 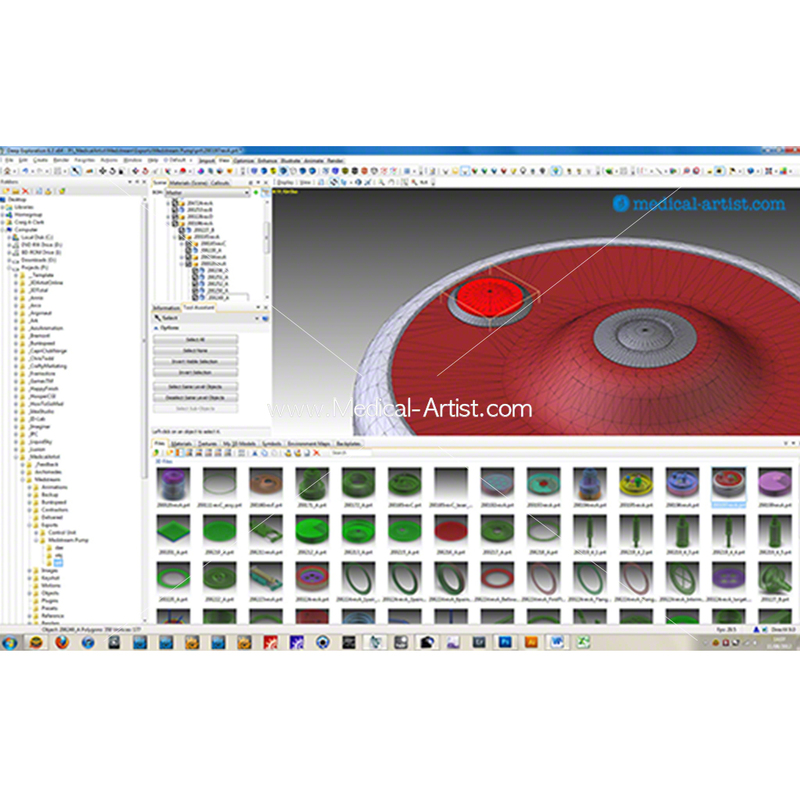 Medical device C.A.D files were used to obtain exact dimensions of all the different components resulting in photo realistic 3D illustrations and 3D animation models could be created. The next part of the project involved creating 3D medical animations of a glass human figure with an anatomically precise spine visible within the body. Integrated into the animation was the photo realistic medical device to demonstrate how the drug is delivered directly into the spine via the Surestream catheter. The result was a glass figure rotating a full 360degrees to give the viewer a full picture of how the pump and its Surestream catheter was integrated into the body. 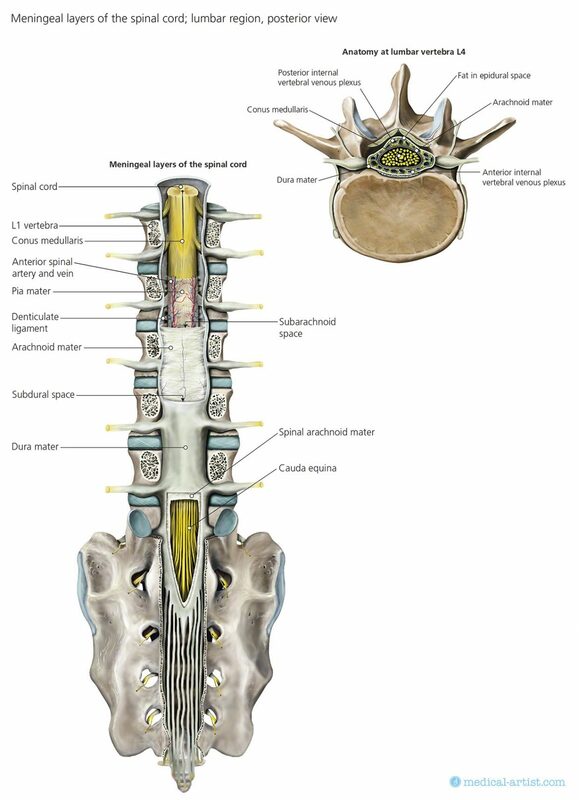 Medical illustrations were created of the posterior view of the spine with a cut through to see inside the layers of spinal cord. The result to use the illustrations as a pull out as part of the printed presentation element. The overall result was the production of an iBook that was successfully used by the J&J sales team and taken around the world to assist with the promotion and sales of the new drug delivery system to help improve patient care for those suffering with chronic pain.